Engines: 2603505686 - 4 Bolt 260 / 350 GW 1955-1986, requires L.H. Short or R.H. Long dip stick, 410lbs. 8:5-1, Two Piece Rear Seal. from California Marine. Description 4 Bolt 260 / 350 GW 1955-1986, requires L.H. Short or R.H. Long dip stick, 410lbs. 8:5-1, Two Piece Rear Seal. 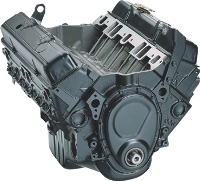 One of our best selling engines. This is a stock GM engine which provides 260HP in it's factory configuration.